Any errors and inconsistencies on your DOH registration application will delay the issuance of your card. If you do not recieve your "329" card in a timely manner, it is because there are uncorrected errors that must be addressed by you. All aspects of the DOH registration are the responsibility and legal concern of the patient. It is submitted to the state DOH as a legal document, signed by the patient, who is responsible for all aspects of the application, except the Physician's Certificate. 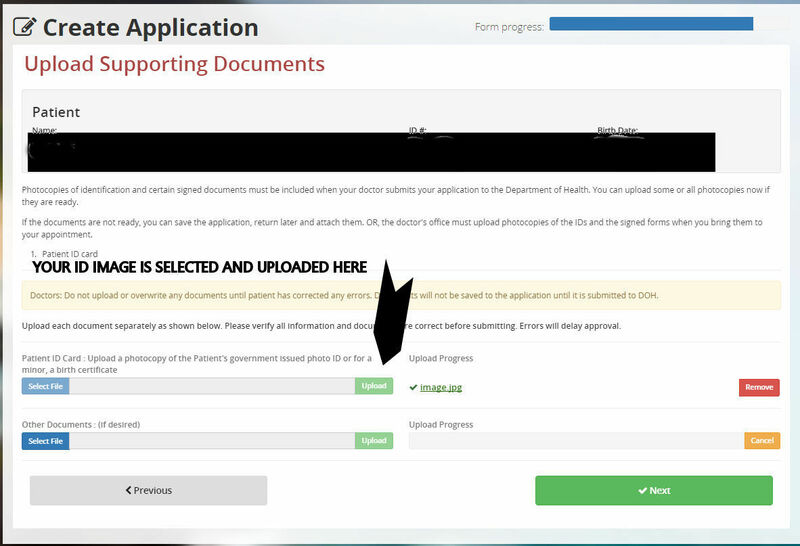 The biggest problem people are having is uploading their documents to the DOH. This is done by making image or PDF files of the documents, whether they are your government issued ID/driver's license/passport, or the certifications. On the uploading page of the online process, you select the image file and its location on your computer/tablet/phone, and then select the upload button. That is all there is to it.NOTE: Please label your files to be uploaded with your first and last name along with what the file contains, i.e., Smith_John ID.jpg, or Smith_John Certificate D.pdf. Only upload the documents that the DOH is requesting. Do not upload your past MJ license, or your medical records. Make sure that your government issued ID/DL/Passport image is a good copy and clearly readable. The next biggest problem is the middle names! Please fill out the online application with the exact same name as on your driver's license/ID, or whatever govt issued document you are using for the application. If your full middle name is on your ID/driver's license/Govt document, then you must do the same online. If your ID has only the first letter of your middle name, then only put that in the middle name field. The middle name is NOT optional, even though the DOH website says it is, if it is on your ID/DL/passport and the great majority of people have something there. A suffix is JR., III, IV, etc. NOT MISS., MR. , MRS. Do not put anything in the suffix field unless you have one in your official name. If it is not on your ID, do not add it. Apartment and Unit numbers go in the first address field with the street number and name, not the second address field. Make sure you put down the correct island of your residence. Too many people have selected Hawaii when they do not mean the Big Island. Make sure to put the correct island down in the addresses: The Island of Hawaii is the Big Island, not the state. One can NOT use a PO BOX as a residential address. Many people are not being careful about their ID/DL numbers, dates, etc. The state forms have to match the Driver's license information EXACTLY. Please fill out all the required portions of the Certificates. Caregivers tend to forget to place their initials where required. If you can't read all the information on your Gov't issued ID, then neither can the DOH. Please submit only good copies, and preferably in color. The DOH does not ask for any copies of old cards. The DOH does not want copies of your medical records. Please just upload the images for which they ask. If the DOH finds any errors, they will email you with the concern and how to fix them. Fixing these are between you and the DOH. It is impossible for us to fix any errors, at all, at any time. In order received, listed are the most recent reasons that the DOH cited when they rejected these applications and asked by email for the person to fix the errors. I receive notice, because they cc me by email, but rarely do I recognize the email address so I do not know who made them. I have copied and pasted below those errors received in the first half of 2017. The DOH does highlight the reason in yellow! Grow site certification page 2 incomplete – Caregiver needs to check box who’s growing. See below for details. Grow site address incomplete, please use the tmk field when entering in the tmk. Also please provide a brief description on how to get to tmk address. Online application does not match ID uploaded, ID expiration date on online application does not match ID uploaded. The name entered online does not match what’s on the ID please remove your middle name and resubmit.